Right close to the capital Palma de Mallorca lies the golf course Son Muntaner within the community of Son Vida. The golf club Son Muntaner features an elegant and exclusive clubhouse. The course was planned by the German architect Kurt Rossknecht and opened in the year 2000. The fairways and greens are provided with perfect irrigation which makes them a perfect and juicy green colour. Within the course grounds grows the oldest olive tree of Majorca. The Arabella Sheraton is part of the golf course. A total length of 6036 m makes the 18-hole PAR 72 course a sporting challenge. The restaurants Can Pinyol and Can Tonata are close by. The golf course Son Quint also lies within the community of Son Vida, only a few kilometres from the island’s capital Palma de Mallorca. 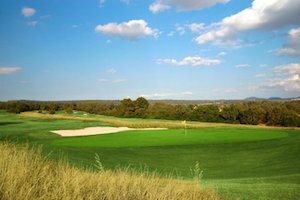 The course was designed by the Spanish architect Ramon Espinosa and the German Kurt Rossknecht and opened in 2007. Old olive and pine trees seperate the lovely fairways. The 18-hole PAR 72 course has a total length of 5929 metres and offers an exclusive view into the bay of Palma. Right in Palma you will find a large selection of restaurants like the La Parada del Mar, the Bruselas, the Misa Braseria, the Ola del Mar and the popular restaurant Temple Nature, just to name a few. 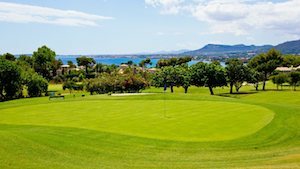 Within the community of Son Vida in the west of the island Majorca lies the golf course Son Vida Golf, which is one of the prettiest golf courses in Majorca. Situated within the golf resort are the hotels Arabella Sheraton, the Castillo hotel Son Vida and the hotel Mardavall Mallroca Resort with a special, luxury class service. The golf course Son Vida is a golfing paradise which leaves no wishes unfulfilled. It is also the oldest golf course of the Balearic Islands and was opened back in 1964. The exclusive club had a grand opening featuring “Rainer of Monaco”. The 18-hole PAR 71 course has a length of 5601 metres. From the greens, fairways and tees one has a fantastic view into the bay of Palma de Mallorca. Exclusive restaurants in Palma are only a few driving minutes away. Recommended are the “Gaudeix”, the “Tapa Negra”, the “Sa Casa”, the “El Buey” and the restaurant “Koa”. 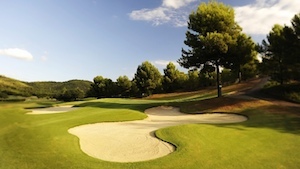 The golf course Poniente lies in the community of Calvia in the southwest of Majorca. The town Magaluf is only 1 km away. Golf de Poniente was designed by the architect John Dering Harris. 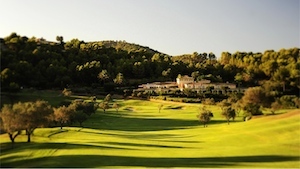 The clubhouse is built in the style of Majorcan country houses. The course offers very varying and interesting fairways. 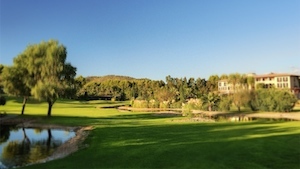 The 18-hole course has a total length of 6426 metres and is situated only 15 driving minutes away from Palma. You can find the restaurants El Mundo, La Bodega, Na Waab and the famous restaurant Pirates Beach Bar and Grill in the tourist resort Magaluf. Magaluf is especially popular among British tourists. The golf course Golf Maioris lies close to a beach within the community of Llucmajor in the south of the island Majorca. The drive to the airport takes only a few minutes. The clubhouse includes a pro shop and a restaurant. The course features interesting and extraordinary greens with dream views, some of them all the way to the Mediterranean Sea. The 18-hole PAR 72 course has a length of 6347 metres. The community Llucmajor offers great restaurants such as the Pescara, the Bella Italia and the Mhares Sea Club. The island Majorca offers a large and exclusive selection of beautiful golf courses, Golf Maioris being one of them. The golf resort La Reserva Rotana lies in the east of Majorca within the community of Manacor. The course is part of the hotel Rural La Reserva Rotana and is exclusively for hotel guests. The entire resort with its large grounds of 2,5² km features an old tree stock of olive trees and pines. The 9-hole PAR 36 course has a length of 2815 metres. It was completed by the architect Francisco Lopez Segales in 1986. Here one plays the fairways without a sense of hectic or time pressure. Right in Manacor you will find the nice restaurants Mingo, La Bruschetta Nueva SL, Can March and the Italian restaurant Tutto Pasta Ristorante. The golf course Golf Park Puntiro lies in the west of Majorca between Palma and Sineu. A pro shop is located within the clubhouse. It’s about 15 kilometres to the airport. This golf course was planned by the exclusive company Nicklaus Design and is ranked amongst the best golf courses in Spain. The course and the areas between fairways feature Mediterranean vegetation and flora. The 18-hole PAR 71 course has a length of 6207 metres. Close by lies the village Sineu, where you can find the nice restaurants “Sa Fabrica”, “Celler Son Toreo”, “Es Grop” and the pizzeria “Xiroi”. 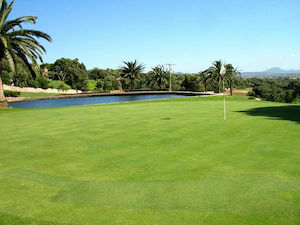 The golf course Son Severa Golf is located in the east of the island Majorca, only a few kilometres from Cala Ratjada. This course was opened way back in 1967 and designed by the architects Francisco Lopez Segales and John Harris. The 18-hole PAR 72 course has a length of 6000 metres. You can enjoy a fantastic view of the sea from the clubhouse. The fairways are in excellent condition. The tree stock is characterized not only by pines but also holm oaks. It’s a course with special flair. Son Severa offers the following restaurants: The “Binicanella”, the “Peperoncino”, the “Esport” and the Italian restaurant “La Bruschetta”.